Get an Exclusive Sneak Peek at Lee Child's Next Reacher Book! Fans of best-selling author Lee Child's wildly popular series of Jack Reacher novels have even more reason to celebrate the May 7th Blu-ray and DVD debut of the compelling hero's first feature film. Jack Reacher packages for sale will include a unique promo code to an exclusive sneak peek at Lee Child's next Reacher book, Never Go Back. For a limited time, purchasers can download the entire first chapter--weeks before the new novel hits shelves. Filled with heart-pounding action, thrills and a "killer chase scene" (Chris Vognar, Dallas Morning News), Jack Reacher is "hard-boiled detective story entertainment" (Richard Corliss, Time) that "will have you gasping in surprise at the velocity and ferocity of the action" (Marshall Fine, Huffington Post). Tom Cruise tackles the title role with the brute force his character is known for and his "tightly controlled performance holds our attention all the way through to the tense finale" (Elizabeth Weitzman, New York Daily News). Jack Reacher will be available May 7, 2013 in a Blu-ray/DVD combo pack that is bursting with compelling bonus features including an in-depth look at Reacher's journey to the screen, the filmmakers' devotion to remaining true to the essence of the character and their drive to create an action-thriller that harkens back to the landmark films of the '70s. The combo pack also includes a look at the training and stunt choreography behind the gritty and intense fight sequences, an exploration of the Reacher phenomenon around the world with Lee Child, as well as commentaries by Tom Cruise, director Christopher McQuarrie and composer Joe Kraemer. The film will also be available as a single-disc DVD. HOLLYWOOD, Calif. (March 5, 2013) - One of the most compelling heroes ever to step from novel to screen makes his highly-anticipated home entertainment debut when Jack Reacher blasts his way onto Blu-ray, DVD and On Demand on May 7, 2013 from Paramount Home Media Distribution. The film will be available for Digital Download on April 23rd. Tom Cruise tackles the title role with the brute force his character is known for and his "tightly controlled performance holds our attention all the way through to the tense finale" (Elizabeth Weitzman, New York Daily News). Based on best-selling author Lee Child's wildly popular series of novels, Jack Reacher was adapted for the screen and directed by Academy Award(R)-winner Christopher McQuarrie (Best Original Screenplay, The Usual Suspects, 1995). Filled with heart-pounding action, thrills and a "killer chase scene" (Chris Vognar, Dallas Morning News), Jack Reacher is "hard-boiled detective story entertainment" (Richard Corliss, Time) that "will have you gasping in surprise at the velocity and ferocity of the action" (Marshall Fine, Huffington Post). The film also boasts "a top flight ensemble cast" (Claudia Puig, USA Today) including Robert Duvall (Apocalypse Now), Rosamund Pike (Die Another Day), Werner Herzog (Rescue Dawn), David Oyelowo (Rise of the Planet of the Apes), Richard Jenkins (The Cabin in the Woods) and Jai Courtney (A Good Day to Die Hard). The Jack Reacher Blu-ray/DVD combo pack with UltraViolet(TM) is bursting with compelling bonus features including an in-depth look at Reacher's journey to the screen, the filmmakers' devotion to remaining true to the essence of the character and their drive to create an action-thriller that harkens back to the landmark films of the '70s. The combo pack also includes a look at the training and stunt choreography behind the gritty and intense fight sequences, an exploration of the Reacher phenomenon around the world with Lee Child, as well as commentaries by Tom Cruise, director Christopher McQuarrie and composer Joe Kraemer. The film will also be available as a single-disc DVD. 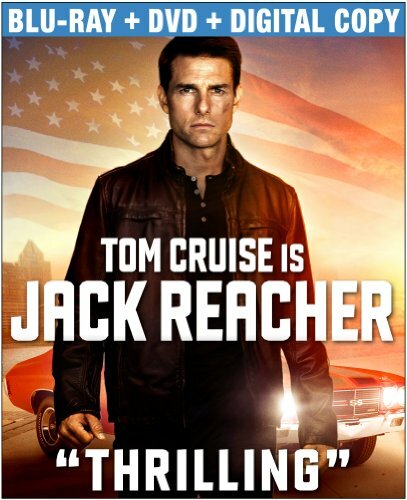 Paramount Pictures and Skydance Productions present a Tom Cruise Production: Jack Reacher . Executive produced by Jake Myers, Ken Kamins, Kevin Messick, David Ellison, Dana Goldberg and Paul Schwake. Produced by Tom Cruise, Don Granger, Paula Wagner and Gary Levinsohn. Written for the screen and directed by Christopher McQuarrie.